On May 9th, at 7pm, Aisha will read alongside Imani Mixon at the Motor Signal Reading Series in Detroit. May 13th at 7pm, she will be in conversation with Morgan Parker at the Ann Arbor District Library. On April 10th at 5:30pm, Aisha was in conversation with Edwidge Danticat for the Helen Zell Writers Series at the UMMA Helmut Stern Auditorium. April 4th Aisha had the honor of reading at Reed College’s Visiting Writer Series in Portland, Oregon. She participated in some AWP PANELS: This and this. Wednesday, March 27th, Aisha was part of an AWP offsite group reading SO Homo/No FOMO at 7pm. On Thursday, March 14th, Aisha was in conversation with Halle Butler at Literati Bookstore in Ann Arbor. On Thursday, February 28th, Aisha read with Nandi Comer at Pages Bookshop in Detroit. On February 15th, Aisha read with Hannah Ensor at The Room Project in Detroit. On Thursday, November 1st, Aisha read for Temple University’s Poets and Writers series in Philadelphia. At &NOW on Saturday, October 6th, Aisha was part of a panel titled “I Feel Both Ways” with Lucy Corin, Sara Marcus, and Jean Yoon, moderated by Sara Jaffe. On April 26th she read for the Community & World Literary Series at Cal State San Marcos in San Diego. April 23rd Aisha gave a reading for the Narrow Chimney Reading Series in Flagstaff, Arizona. April 11th through the 13th, Aisha joined Alan Shapiro, Geoff Dyer, Mary Gaitskill, and Rosanna Warren as featured readers at the Spring Literary Festival at Ohio University in Athens, Ohio. On April 3rd, she read with the luminous Barbara Browning at Bluestockings at 7pm. On April 2nd at 8pm she joined Kate Zambreno in conversation as part of the Art + Life series at Columbia University in New York City. On the evening of March 9th, she wa part of an off-site AWP event: “All Human Reading” at Southern Brewing. On February 11th at 5pm Aisha read in Los Angeles at the Mandrake Bar for “It’s Five o’clock Somewhere” with Steve Erickson, J. Ryan Stradal and Mari Naomi. February 20th she gave a workshop and read at Miami University in Oxford, Ohio. On November 17th Aisha gave a reading with Amy Knight at Antigone Books in Tucson. Aisha gave a reading at the University of San Diego on November 1st. She took part in the U of A’s MFA Homecoming Reading on October 27th at Exo Roast Co. Her BOOK RELEASE PARTY! was at Exo Roast Co. in Tucson on October 23rd. On October 7th, Aisha was a featured author at the Northern Arizona Book Festival in Flagstaff, Arizona. Aisha gave a reading and a master class as part of the Axton Visiting Writers Series at the University of Louisville, September 28-29th, 2017. In June, Aisha joined Wayne Koestenbaum and Karl Ove Knausgård as a keynote speaker at the NonfictioNOW conference in Reykjavik, Iceland. Aisha read at Antigone bookstore as part of the How We Speak to One Another anthology group reading on April 14th. She also read at Antigone bookstore as part of the Truth to Power anthology group reading on March 31st. She presented a talk on race and experimental prose at the Power of Narrative Conference at Boston University on March 26th. She read with C.S. Giscombe for POG in Tucson on February 18th. She had the ridiculous honor of reading alongside Lisa O’Neill, Kristen Nelson and TC Tolbert before DAR WILLIAMS performed Tuesday, January 10th at the Rialto in Tucson. She read in San Diego for the NOW That’s What I Call Poetry Vol. 29 Reading at Tiger! Tiger! on November 20th. On October 26th at 7pm, she gave a reading at Salt Lake Community College. She read for the Satellite Reading Series at Bentley’s Coffee and Tea on Saturday, October 8th. She read for an event called “If Your Body Could Talk, What Would It Say?” as part of the Kore Press UnSilencing Anatomies Project on October 7th at the Mercado St. Augustine in Tucson. From April 20th through the 22nd, Aisha was part of the Ithaca College New Voices Literary Festival. March 25th-27th, she taught a weekend-long creative writing workshop at Pima Community College. Aisha read with Lidia Yuknavitch for the “Fair Weather Series” at Casa Libre en la Solana on October 31st. She read with a host of others at the POG and Friends reading at 7pm Saturday, October 19th at Conrad Wilde Gallery. Aisha recently taught a course on the art of researching the personal essay at the University of Arizona Poetry Center. On July 15th at 7:30 pm, Aisha read with Joel Hans and Andie Francis for The Edge Series, hosted by Melissa Buckheit. On April 28th at 7pm, Aisha read with Beth Alvarado and Lisa O’Neill for Trickhouse Live! at Casa Libre en la Solana. On March 28th at 11:30 AM, Aisha had the best day of her life / was part of a reading entitled “Don’t Call it Lyric: Inquiry, The Essay and Independence” along with Brian Blanchfield, Amarnath Ravva and Maggie Nelson at the & Now conference in Los Angeles. On January 15th, Aisha presented at the Black Life Matters Conference in Tucson, Arizona. During the autumn of 2014, Aisha taught courses in Creative Writing and African American Literature as a Visiting Assistant Professor at Carleton College. Aisha is thrilled to have been named a finalist for the Write-A-House inaugural residency in Detroit. Congratulations to Casey Rocheteau on her big win! On September 11th, 2014, she gave a reading at Coastal Carolina University at 7pm. Aisha taught for the University of Michigan’s amazing New England Literature Program in the spring of 2014. She ran a workshop on the architecture of the essay at the Mark Twain House & Museum’s Third Annual Writer’s Weekend: Saturday, April 26th at 2pm. On Thursday, April 24th, 2014, Aisha read at Eastern Connecticut State University at 5:30pm. Aisha signed books on February 27th, 2014 at the University of Iowa Press table (1901) at the AWP Bookfair in Seattle. She also took part in Prospecting: The Terrain.org Literary Reading on Thursday, February 27, from 7-8:30 p.m. at the auditorium of the Klondike Gold Rush National Historical Park in Seattle’s Pioneer Square. On February 10th, 2014, Aisha read for the University of Arizona Poetry Center’s Prose Series with Arianne Zwartjes. October 15th at 7pm, a reading for the Intermezzo series at Tucson’s Temple Lounge with Boyer Rickel. Hosted by Brian Blanchfield. Aisha recently took part in a book tour for the summer of 2013 with friend and fellow University of Iowa Press author, Arianne Zwartjes. See pictures from the trip on their blog! On June 9th, she took part in the Roar Shack Reading Series’ event, “The Rims and Borders” on Sunday, 4-5:30 at 826 LA with Thaisa Frank, Julia Ingalls, Zoe Ruiz, and music by The Six Shooters. On Sunday, May 5th, 2013, Aisha read with Zoë Ruiz, David Rocklin, Julia Ingalls and Joe Loya for the Portuguese Artist’s Colony at the Make-Out Room in San Francisco. 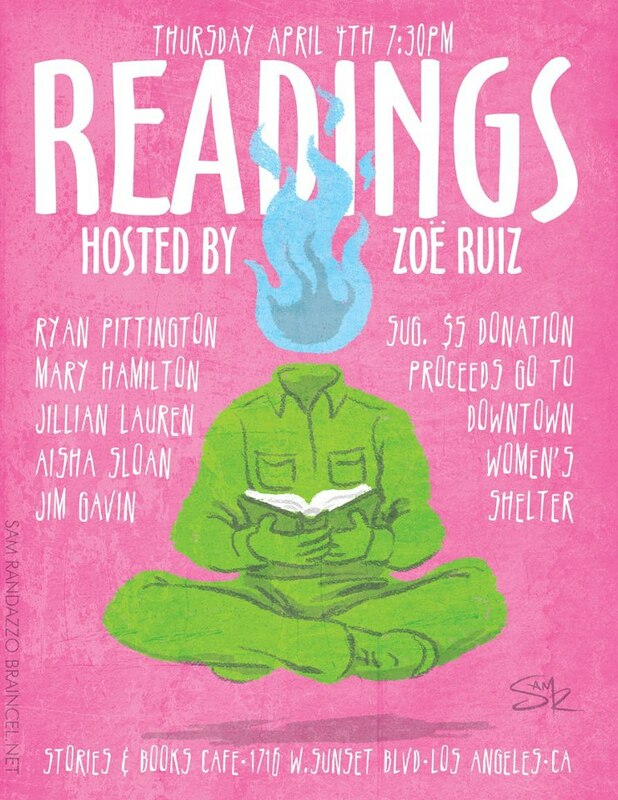 On April 4th, 2013 Aisha read with Jim Gavin, Mary Hamilton, Jillian Lauren and Ryan Pittington at Stories Books and Cafe in Los Angeles as part of Zoë Ruiz’s “Readings” series.